Canadian women's kayak team won gold on Saturday, capturing the first medal at the Pan Am Games. 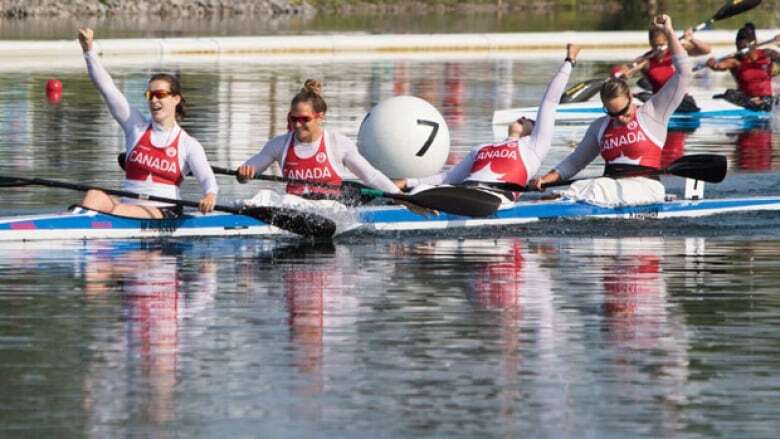 The women's kayaking team set the tone for Canada at the Pan American Games on Saturday, giving the host country the promising start it was looking for. Michelle Russell, Emilie Fournel, KC Fraser and Hannah Vaughan raced to gold in the four-person 500-metre event Saturday morning, guaranteeing Canada would come away from its very first event with the best possible result. Canada has set a goal of finishing in the top two in the overall medal count at the Games, with Canadian chef de mission Curt Harnett estimating the host team of 719 athletes will need to rake in about 200 medals over the 16 days of competition to hit that target. The Canadian paddlers said having a granstand full of fans on their side helped them bring home that first gold. "I can't describe it," said an overwhelmed Russell. "I can't find the words to describe how it feels to win gold, in the Pan Am Games, in Toronto, on home soil, the very first medal. I can't. "There's too many factors going in to how I feel. I can't pick out one single thing." Canada finished the K-4 500 in one minute 36.495 seconds, 1.17 seconds ahead of second-place Cuba. Argentina was third, 1.226 seconds off the winning mark. The race was the first final of the Games, which officially opened Friday in Toronto. "We spend a lot of time racing in Europe and when we're in Europe you hear the crowd roaring and I like to pretend it's for me and tell myself 'Oh, those are my fans,"' said Vaughan, from Dartmouth, N.S. "Here you don't have to pretend. You know they're your fans and they're all here for us. "It's a really incredible feeling having that." It's not a top-flight paddling field at these Games as many of the world's top-ranked athletes are from Europe. The Canadians are familiar with the Welland Flatwater Centre, where they have both trained and competed. Russell won gold in the K-1 200 metre event and bronze in the K-1 500 metres at the 2013 under-23 world championships at the same venue. "We always race at this course but today was a really special occasion," said Fraser, from nearby Oakville, Ont. "There was more family, more everybody. Everybody's here to watch what we do and it's great. I think just today, on home soil, made it that much more special." Russell, from Fall River, N.S., qualified for Monday's K-1 500-metre final later in the morning. She'll also compete in the K-1 200 on Sunday. Montreal's Fournel and Vaughan will compete in the K-2 500-metre final on Tuesday. All four still have a full summer of competition, including the world championships in Milan, Italy, in late August. How they perform this season will determine if they qualify for the 2016 Rio Olympics. "I think I'm getting more and more excited as time goes on," said Vaughan minutes after the medal ceremony. "I still have another race (at the Pan Ams), but this is just momentum for that. I'm so excited about this, about what it means for the rest of the summer and next year for us. "It's getting more exciting as time goes by." Canada's gold-medal winning performance was a blur on Saturday. The smooth surface of the canal was churned up by the seven competing crews, with water splashing in the faces of the paddlers. "There was so much water flying everywhere and I was seeing mostly stars," said Fournel. "I had no idea where I was. I knew I was in my lane, I knew I was following Michelle, I knew the girls were in the back because I could feel their power." Russell, who sits in the kayak's bow, added with a laugh: "I think I had the most eyesight and I still didn't know where we were." "It's probably the biggest and heaviest medal I've ever gotten," said Fraser, playing with the ribbon around her neck. "When I put it on it really shows how much work we've put into it. The work, the years we've put in, we really appreciate, as athletes, what we do." "On behalf of all Canadians, I would like to congratulate the women's K-4 kayaking team on winning Canada's first Pan American Games gold medal in the women's K-4 500 metres event. "This is a tremendous achievement for the team of Emilie Fournel, K.C. Fraser, Michelle Russell and Hannah Vaughan. Canadians across the country and around the world are extremely proud of their accomplishment. "Congratulations as well to their coaches and training staff for their countless hours of hard work, passion and commitment. "Our Canadian team is full of dedicated, talented athletes. Along with all Canadians, I look forward to more fantastic moments and achievements from our Canadian athletes throughout the Games."